The Supreme Lord is situated as Paramatma in everyone’s heart, and it is from Him that all activities are initiated. 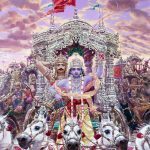 The living entity forgets everything of his past life, but he has to act according to the direction of the Supreme Lord, who is witness to all his work. Therefore he begins his work according to his past deeds. Required knowledge is supplied to him, and remembrance is given to him, and he forgets, also, about his past life. Thus, the Lord is not only all-pervading; He is also localized in every individual heart. He awards the different fruitive results. He is worshipable not only as the impersonal Brahman, the Supreme Personality of Godhead, and the localized Paramatma, but as the form of the incarnation of the Vedas as well. The Vedas give the right direction to people so that they can properly mold their lives and come back to Godhead, back to home. 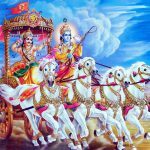 The Vedas offer knowledge of the Supreme Personality of Godhead, Krishna, and Krishna in His incarnation as Vyasadeva is the compiler of the Vedanta-sutra. The commentation on the Vedanta-sutra by Vyasadeva in the Srimad-Bhagavatam gives the real understanding of Vedanta-sutra. The Supreme Lord is so full that for the deliverance of the conditioned soul He is the supplier and digester of foodstuff, the witness of his activity, and the giver of knowledge in the form of Vedas and as the Supreme Personality of Godhead, Sri Krishna, the teacher of the Bhagavad-gita. He is worshipable by the conditioned soul. Thus God is all-good; God is all-merciful. Antah-pravistah sasta jananam. The living entity forgets as soon as he quits his present body, but he begins his work again, initiated by the Supreme Lord. Although he forgets, the Lord gives him the intelligence to renew his work where he ended his last life. So not only does a living entity enjoy or suffer in this world according to the dictation from the Supreme Lord situated locally in the heart, but he receives the opportunity to understand the Vedas from Him. If one is serious about understanding the Vedic knowledge, then Krishna gives the required intelligence. 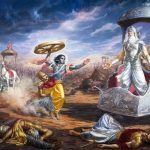 Why does He present the Vedic knowledge for understanding? Because a living entity individually needs to understand Krishna. Vedic literature confirms this: yo ’sau sarvair vedair giyate. In all Vedic literature, beginning from the four Vedas, Vedanta-sutra and the Upanishads and Puranas, the glories of the Supreme Lord are celebrated. By performance of Vedic rituals, discussion of the Vedic philosophy and worship of the Lord in devotional service, He is attained. Therefore the purpose of the Vedas is to understand Krishna. The Vedas give us direction by which to understand Krishna and the process of realizing Him. The ultimate goal is the Supreme Personality of Godhead. Vedanta-sutra (1.1.4) confirms this in the following words: tat tu samanvayat. One can attain perfection in three stages. By understanding Vedic literature one can understand his relationship with the Supreme Personality of Godhead, by performing the different processes one can approach Him, and at the end one can attain the supreme goal, who is no other than the Supreme Personality of Godhead. In this verse the purpose of the Vedas, the understanding of the Vedas, and the goal of the Vedas are clearly defined. Just as I am the fire in the stomach, I am also dwelling in the hearts of all moving and non-moving entities, in the form of the element buddhi, intelligence. From me in the form of intelligence (mattah), there is remembrance of sensations from objects previously perceived. From me there is also knowledge, arising through contact of the senses with the sense objects, and also the removal of both knowledge and memory. 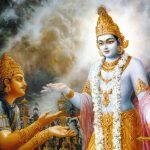 Having told how he helps the jiva in his bound state, the Lord then tells how he assists the jiva to attain liberation. I am known through the Vedas. I alone made Vedanta through Veda Vyasa, because I alone know the Vedas (veda vit): I know the real meaning of the Vedas, and no one except me knows the real meaning. 15.15 Controlling everything by My will, I exist as ‘the self in their hearts’, namely, in the place from which springs knowledge, the root of activity and inactivity of all beings as also of the Soma and digestive fire. So the Srutis declare in the following texts: ‘Entering within, He is the ruler of all things and the Self of all’ (Tai. A., 3.11), ‘He who, dwelling in the earth … He who, dwelling in the self, is within the self … who controls the earth’ (Br. U. Madh., 3.7. 3. 22); ‘The heart which is comparable to an inverted lotus-bud’ (Ma. Na., 11.7); and ‘Now, here, in the city of brahman, is an abode, a small lotus-flower’ (Cha. U., 8.1.1). The Smrtis also declare thus: ‘Visnu is the ruler of the whole universe, who permeates the universe’ (V. P., 1.17. 20), ‘He is the ruler of all, who is minutely small among those who are minutely small (Manu., 12.122); and ‘He is the controller, the judge, the King, who is seated in your heart’ (Ibid., 8.92). Therefore, the memory of all beings springs from Me alone. ‘Memory’ is knowledge springing from experience and its subtle impressions. They have for their contents past experiences. ‘Knowledge’ is determination of a thing through the senses, inference, the scriptures and intuitive meditation. This is also from Me. So does ‘Apohana’ too. ‘Apohana’ signifies the cessation of knowledge. ‘Apohana’ may also mean ‘Uhana’ (conjectural knowledge). Uhana is ‘Uha’ (conjecture). ‘Uha’ is that knowledge which is accessory to the actual means of knowledge (Pramana). It is done by determining whether that means of knowledge can be operative with reference to the particular subject-matter on hand, through the examination of the instruments of that means of knowledge (Pramana). This ‘Uha’ also comes from Me. Indeed ‘I am to be known from all the Vedas,’ for I am the inner ruler of Agni, Surya, Soma, Vayu, Sun and Indra and other divinities as their self. The Vedas are intent on speaking of them (i.e., the divinities). ‘I am to be known from all the Vedas; for, terms like gods, men etc., signify the individual selves in them. I bring about the fruition of the Veda. ‘Vedanta’, here means the end, namely, the fruition, of Vedic injunctions like ‘Let sacrifice be made to Indra’ and ‘Let sacrifice be made to Varuna.’ For, all Vedas find their consummation in fruition. ‘Antakrt’ means grantor of fruits. The meaning is: ‘I alone am the grantor of the fruition described in the Vedas.’ This has been already declared in the verses beginning from, ‘Whichever devotee seeks to worship with faith whatever form’ and ending with, ‘From that faith he gets the objects of his desire, granted in reality by Me alone’ (7.21 – 22); and also ‘I am the enjoyer and the only Lord of all sacrifices’ (9.24). I am the knower of the Vedas; I know the Veda that speaks about Me. 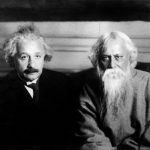 The sense is that he who speaks of the meaning of the Vedas as otherwise than this import, is not the knower of the Vedas. Therefore, listen from Me alone the meaning or the essene of the Vedas. 15.15 Sarvasya etc. The heart (core) of all obejcts is the Awareness which has the freedom of drawing in all [beings within itself] In it exists [as identical with it] the I-consciousness. From This are born (1) the faculty knowing, which is illumining anything new – a faculty which is (hence) in the form the mighty creation of the universe; (2) he faculty of differentiating, like fancying ‘This is nothing but a pot’, which fancying is in essence a sort of limiting Its status of being everything; which is suitable for the perceiver, full-of-Illusion in the form of creating a bonded Soul; and (3) also the faculty of remembrance which is the faculty of reilluminating what has been reduced ot mental impression and has been [thus] with-drawn. These [three] are inclusive of all [sorts of] knowledge. Thus [the Lord’s primary] doership, which is nothing but the sovereignty of will and which presupposes His ominscience, has been taught [in this verse here]. By means of all [the Vedas] etc. : Indeed nothing, but the Supreme Lord is to be explained and proved by all the scriptures. [The description of the Lord] as the author of the Vedas and the ends of the Vedas (Upanisads) amounts to say this :- The Bhagavat alone has got the sovereign freedom in creating the entire universe, through the medium for the actions, their results, their [mutual] connections etc., and in re-establishing it on His (or its) own nature after rooting it out. Thus the Lord’s creatorship with regard to the universe is explained. Others say : The word apohanam denotes the faculty of excluding (viz), ‘This results from this non-performance.’ [Again Vedantakrt] means : ‘He effects the final part of the Vedas’ i.e.. by absorbing them into Himself. Similarly [with] ‘the Vedas’ too. sarvasya — of all living beings; ca — and; aham — I; hṛdi — in the heart; sanniviṣṭaḥ — situated; mattaḥ — from Me; smṛtiḥ — remembrance; jñānam — knowledge; apohanam — forgetfulness; ca — and; vedaiḥ — by the Vedas; ca — also; sarvaiḥ — all; aham — I am; eva — certainly; vedyaḥ — knowable; vedānta-kṛt — the compiler of the Vedānta; veda-vit — the knower of the Vedas; eva — certainly; ca — and; aham — I.